TOO FUNNY! I loved it! BTW, the picture with Bushy Boy in the airplane hanger (page 6) was taken in Kissimmee..... I remember that being in the newspaper when he was here. They sure found the most unflattering pictures of Kerry.What a goof. it never really occurred to me that this phenomenon is strange until today, washing my hands. the little blob of semi-dry soapy gel on the floor tiles under the soap dispenser. why is there a puddle of soap there? i certainly didn't add to it whilst i dispensed myself a handful of soap. in fact i don't recall ever having that happen to any soap dispenser i've used in the past. what kinda person would be so careless as to miss or only get partial soap in the cup of his/her hand? (in this case, his). in a rush? looking in the mirror? there is a very minimal amount of concentration involved in this task. does the soap dispenser leak? not when i'm around. i never really thought it was strange before. i more or less thought "o well these things happen, the soap is over the floor.. naturally some will spill from someone"
but you know what? who would spill?? 1. Some soap dispensers DO leak. If someone is hard on the little plastic level mechanics that hold back the liquid soap, it'll drip out slowly onto the floor (this happens at school from time to time and is easily fixed by reseting the lever and putting in a new bag of soap. 2. I'm guilty of another soap blunder. I've pulled my hands away on many a dispenser only to look back and see that the soap wasn't done coming out. BLOOP.... there it is, adding to the nice little puddle by the sink. It's not that I missed my hands completely, but the dispenser had a little discard AFTER I had the main portion of the soap in my hand. In women's restrooms - there always seems to be puddles of water around the sink. And usually, in places where it's notorious for a dripping soap dispenser...there's napkins placed underneath. and fyi - that stupid word verification took me about 4 tries! I can see now dammit! I got lasik!! grrr. yes look at me flossin with my new diggs. that's right, i finally got a wizard hat proper. that's all i was looking for. either baldness or to have a proper magician hat. like merlin or dumbledore or gandalf. nowhere in any fantasy realm do wizards wear cowboy hats or headbands that came from the 80s. you should see the countless nonsensical items that you can wear as clothes in WoW. and part of the problem is, the crummy-looking gear probably will give you better stats than what you want to look like. i ran around for weeks wearing a black hood with little bat ears because it protects me better than the cowboy hat. i was thinking about writing blizzard an email saying just that. sure is a good thing reality set in before that happened. 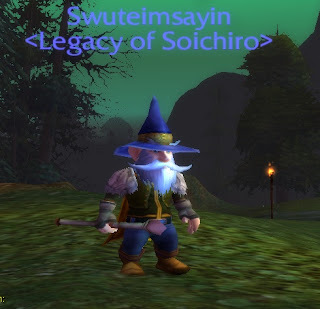 so i'm a lvl 38 gnome mage now, and that never gets less awkward to say out loud. i've discovered that you can do death matches that are actually not all that bad. oh ya, btw. i'm not really a nerd, i just play one in a virtual fantasy realm. you still look like a midget mountain man. I used to date a guy infatuated with WOW. He had like, 4 different characters he'd choose from on any given day. One of them was so ugly/scary looking that I just couldn't even look at it. i accidentally pressed the down channel button while watching HBO. HBO being the lowest number premium channel, i usually start there and puruse upwards through cinemax and showtime. yes! found a good hindi music video/film channel. takes me back to the days watching roshni and dhanik in south florida. "blah blah blah.. don't know geography? no problem! don't know english? no problem! we'll help you! just call 1-800- 955-TAXI. we have the highest employment rate for new recruites"
...like a swift kick in the karachi? LOL. talk about a waste of money! (well, just the part that it's english, bragging they'll still work with non-english speakers). do YOU need a good cause?! 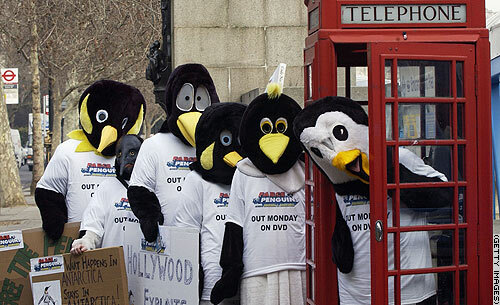 this is a pic of the "farce of the penguins liberation group"
that's what these people call themselves. figures they come out of england, land of wacky protesters. they are protesting against the exploitation of penguins in movies like happy feet and march of the penguins. ok these people need to find a new cause. maybe they all were like "we all have different penguin costumes that we love but we don't know how to use them"
we may actually be looking at the entire organization, captured in 1 snapshot. Exploitation of penguins in Happy Feet? You know I don't think a single penguin was killed during the filming of that show nor their sacred stomping grounds desecrated. The March of the Penguins, well they probably weren't paid SAG wages. ok it had to be said. once and far all. the good is that they will allow ANYONE to upload videos for the world to see. the bad is that anyone WILL upload videos for the world to see. i'd say that a solid 95% of all youtube videos are pure junk. dull videoblogs, stupid walks down stairs, tweens laughing at ketchup on the floor.... pure garbage that should never be uploaded to youtube. not to mention that all the "most watched" or "highest rated" videos are of some korean tv show. are there really 5 million koreans all voted for their lame shows all day? or maybe the most viewed is some 30-something hillbilly that tricks everyone to listening to his passionately incoherent ramblings by inserting a picture of britney spears in the middle of his junk. but if i try to watch the star wars gangsta rap, or the cat cleaning machine, or the southpark world of warcraft episode? "this video has been removed yada yada"
and google video aint better. its actually worse. you just wait... they'll start a subscription fee. i have foreseen it. I disagree..... sort of! Youtube was NEVER a bigtime player in copywrited media. Most TV shows that went up where always taken down fairly quickly. It is, and remains, a dumping ground for people's home movies, etc. On that note, there are some very entertaining home movies out there. It is what it is. Anyways, have you seen ifilm.com? They had on there those never to be seen superbowl proposal commercial. And I also found on there the clip of Rosie going off about Anna Nicole the morning she died...Couldn't find that on youtube. 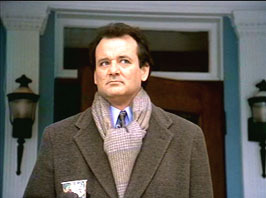 happy groundhogs day to all those punxatawnians. punxatawniites? punxatawnons? Throw the groundhog down da well..